These concepts are fundamental to the advance of science. Science thrives when scientists collaboratively conduct and publish research, when they are able to communicate easily, when the young generations have unrestricted access to university education. The EPLANET Programme advocates the above mindset. The Programme allocates funds to Latin American and European scientists from the HEP field, especially young scholars, to visit European and Latin American research institutions respectively. It aims to establish bridges of communication and consolidate the collaboration between the Latin American and the European HEP community as well as provide advanced training to young researchers. The story of EPLANET begins with the HELEN project. In 2003 the HEP field had started to advance and, as the plans for the LHC were afoot, it showed enormous potential. Latin America already had a long physics tradition, involving prominent scientists such as Giambiagi, Lattes, Lopes, Moshinsky and Vallarta to name but a few. The need to join forces with the European HEP community, which had well developed infrastructure and considerable scientific knowledge, was apparent. Luciano Maiani, former CERN DG, and Juan Antonio Rubio were the first to realize the importance of a Latin American- European collaboration and they decided to launch a project that would address these concerns. They also received the invaluable support of Veronica Riquer. She arrived at CERN in 2003 and became involved in the project almost immediately. Her connections in the Latin American HEP community proved extremely useful. The outcome of their collaboration was the project HELEN, i.e. the High Energy Latin American European Network, that was approved in 2005 and was funded by the European Commission. The countries that participated in HELEN were Mexico, Chile, Brazil, Argentina, Colombia, Cuba, Venezuela and Peru. The principal aim of the project was to train the new generation of Latin American physicists, with a focus on HEP, and build a stable relationship with the European HEP community. The project provided scientists from Latin America with the funding to visit Europe, mainly CERN, for further education and research. Physicists from Europe also travelled to Latin America, mainly to the Pierre Auger Observatory, an international cosmic ray observatory located in Argentina. In addition, 15% of the budget was dedicated to visits from professors in the network, to give seminars, oversee students and start new collaborations. However, the real novelty of HELEN was that it allowed perhaps for the first time students and young researchers from Latin American countries to participate, thus focusing on the new generation of scientists. Before, only the acknowledged scientists could obtain funding from their governments. Altogether, HELEN was a successful project, as it facilitated the signature of MoU's between LHC experiments and Argentinian and Chilean Institutions and of Cooperation Agreements between CERN and the Governments or funding Agencies of Argentina, Brazil, Chile and Mexico. When HELEN finished in 2009, after four years of successful running, the need for a similar programme was apparent. Unfortunately, it was no longer possible to receive funding from the European Commission. After some research, Maiani, Rubio, Riquer worked with Paolo Giubellino and Jose Salicio Diez to write a proposal for a similar project called EPLANET and submitted it to the 7th Framework Programme – Marie Curie People, which approved it. 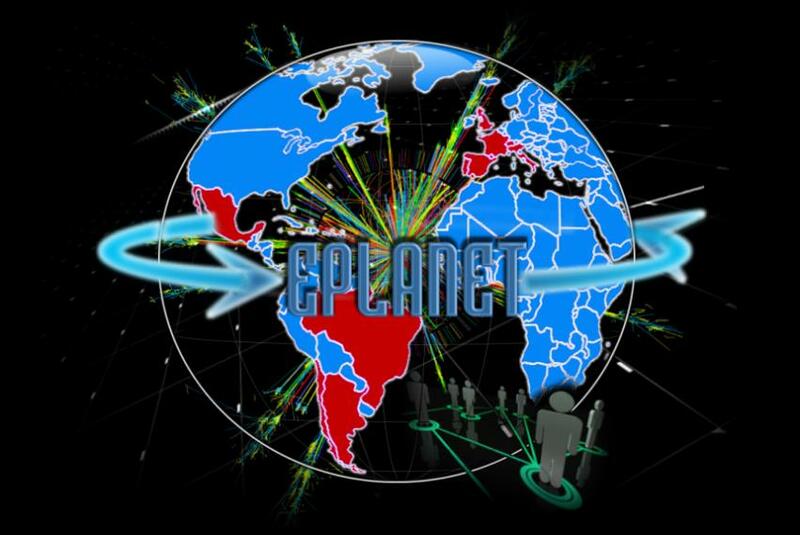 EPLANET was launched in February 2011 and it is programmed to run for 4 years, until 2015. During its lifetime it is going to offer 379 grants for visits to Europe which means that researchers for Latin America will be able to spend in total 1203 months working with their colleagues at CERN. Moreover 476 grants are given for visits to Latin America countries (600 months) offering some training in new technologies and computing techniques as well as working on the analysis of the physics results. Altogether, 12 European Institutions from six countries (Italy, France, Switzerland, Portugal, UK and Spain) (tables 1,2) and 18 Latin American Institutions from four countries (Argentina, Chile, Brazil and Mexico) (table 3) participate in the programme. Tables 1 and 2 showing the participation of European Institutes in EPLANET and the number of months that researches have spent in various laboratories around Europe. Table 3: The number of months that researchers from European institutes spent in Latin-American countries as part of the EPLANET project. 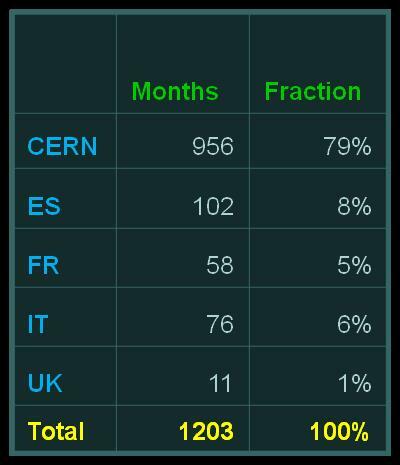 CERN contributes to EPLANET with 108 months of personnel detached to LA Institutions during the 4 years of operation. Although the participation during the first year of the program was quite low, mainly due to the long break between HELEN and EPLANET, it rapidly increased reaching today almost 65% of the planned value. Of course, further efforts are needed to improve the number of detachments in the coming years. Research carried out at a national level often suffers from fragmentation, isolation and compartmentalization. Particularly, in HEP, an extremely complex field, international collaboration in the form of scientist exchanges has proven to be the most effective method for the transfer of knowledge and the training of new physicists. EPLANET aims to foster a sustainable collaboration and strengthen the existing research partnership between Latin America and Europe as well as provide advanced training in the various applications of HEP. Secondary objectives include promoting internal Latin American collaboration and international collaborative research projects. Within this framework, the programme will finance academic exchanges of Early Stages Researchers and Experienced Researchers to various research institutes, mainly CERN in Europe and the Pierre Auger Observatory in Latin America. As a result, the Latin American physicists will be granted access to the best experimental facilities in Europe and acquire technical expertise which will enhance the discovery potential and improve university education in their countries. Moreover, the Latin American community will take advantage of the existing technologies to promote industrial innovation, raising its scientific visibility. As for the European physicists, their contact with another scientific culture will broaden their scope and result in a fresh approach to science. The Programme focuses on the LHC experiments (ALICE, ATLAS, CMS, LHCb), the Auger experiment, particle physics theory, medical applications of particle physics, accelerator technologies and scientific computing, which constitute nine work packages. European senior researchers will be detached to Latin America for short periods of time (1-2 months) in order to improve the educational system and contribute with their knowledge and experience to the training of young scientists. Junior researchers will go on long term exchanges (2-12 months), therefore they will have the opportunity to gain valuable in depth experience of the work in large scientific projects. At CERN, Latin American researchers will participate in the selection, processing and analysis of data taken from the LHC experiments, develop software for HEP experiments, design prototypes of detectors for medical physics, address Standard Model problems, take part in the R&D and much more. The expected deliverables include software releases, scientific publications, detailed reports on experimental results and deployment of computing services. In addition, workshops on every Work Package will be organized, helping the participants of EPLANET share their ideas and experiences and further explore the topic of each WP. Naturally, special emphasis is placed upon assimilating newcomers into the physics collaborations and they will be encouraged to participate in collaboration meetings, present reports of their work and take part in outreach programmes and other activities. 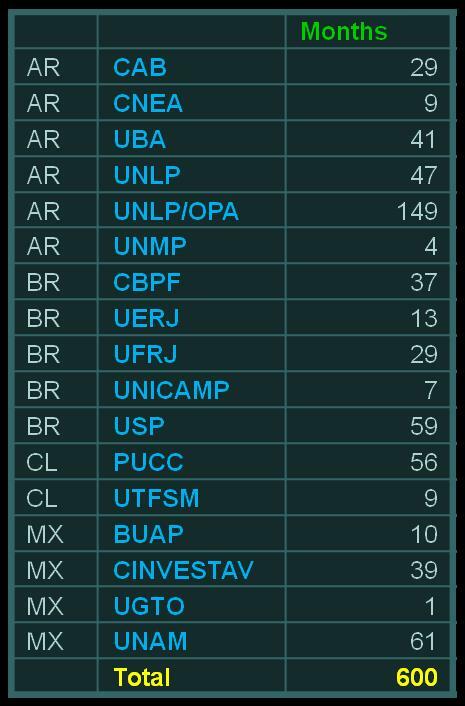 As the recipient of a large fraction of the Latin American grants (79%), CERN provides resources to administer and manage the project. Administrative personnel from the various experiments and activities involved in the 8 work packages help the grantees to find their way at CERN. This includes their reception, their registration, the monthly payment of the grant, the collection of reports, etc. Notably, K. Ross, the secretary of the Head of the PH Department constitutes the point of reference for the administrative personnel and for the scientists coming to CERN, collecting and handling the various documents needed to write the reports and justifications required by the scheme IRSES. C. Hervet, K. Richardson, K. Aspola, A. Yaneva, N. Grub, M. Connor, G. Hobgen, K. Ross, U. Tihinen and T. Pardo, are handling the daily administration of the corresponding work packages. CERN provides not only the administrative support for the work packages but also a few scientists from CERN, P. Giubellino, N. Ellis, K. Aspola, B. Schmidt, M. Pepe-Altarelli, U. Wiedermann, R. Corsini, M. Dosanjh and J. Harvey, are coordinating each of the 8 work packages where CERN is involved. The coordination of the work packages is fundamental to achieve the objectives that have been defined in each, in terms of tasks, deliverables and milestones. In addition to the 108 man-months that CERN fulfills sending scientists to Latin America to teach and help our colleagues in the various activities related to the work packages; CERN also provides a few direct grants to scientists from institutions of Colombia, Peru and Venezuela. These countries, which were included in HELEN, could not be accommodated in EPLANET due to the missing Science & Technology agreement with the European Commission. However, scientists from these countries are active in various experiments at CERN. In particular, Colombia participates in ATLAS and CMS, Peru in ALICE and Venezuela in ATLAS. The grants given by CERN should follow the same rules as those established for EPLANET. On this way, the scientists from these countries could be considered as being part of the project. As of 2013 EPLANET has been running for two years. It has continued the success of HELEN, as the large number of work reports and publications indicate that the objectives mentioned in the original proposal have been accomplished. The presence of Latin American scientists at CERN has been increased considerably. The participants of EPLANET have also contributed significantly to the discovery of the Higgs-like boson, the new particle identified by ATLAS and CMS. In addition, the Programme has resulted in close collaboration between European and Latin American groups. There is still a long way to go but important steps towards improvement have been made.